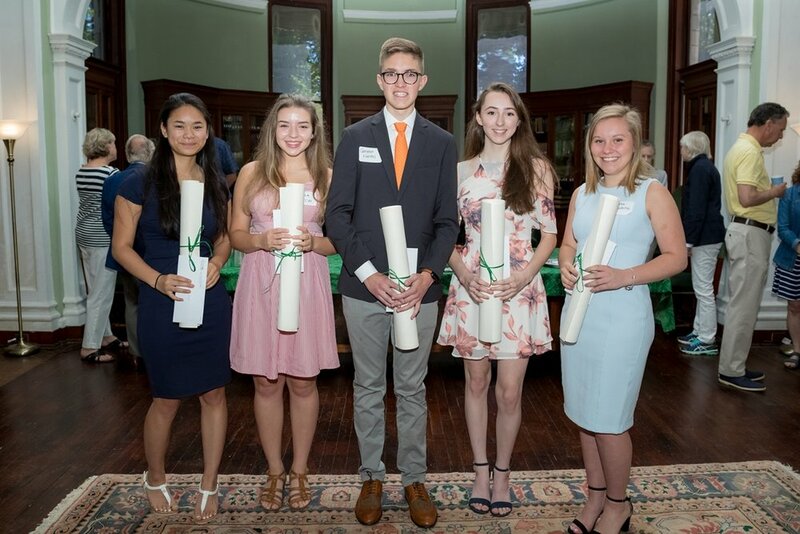 In keeping with their 39-year tradition, the Trustees of the Akin Hall Association Scholarship Endowment Fund fulfilled their mission by honoring the following top ten percent of the students in the recent 2018 Pawling graduating senior class with a total of $55,000 in awards. The 2018 $10,000 scholarship five honorees were presented their awards at the Akin Hall Association’s June 16 Reception at Akin Free Library with family members and school administration present. The following five students will be attending: Elizabeth Barrick, Washington University at St. Louis; Emma Martin, University at Rhode Island; Abigail Reid, Cornell University College of Agriculture and Life Sciences; Martha Topolnitski, North Carolina State University and Cameron Walters, Clemson University. At the Pawling Senior Awards night, James Bellucci received $2000 to help with his personal expenses with his appointment at West Point Military Academy. Also, Alex Badia, Kelly Koerner, and Olivia Zoeller received $1000 Merit awards. The Association was formed over 100 years ago by Albert J. Akin, a Pawling benefactor, who provided the Akin Free Library building and an endowment to promote and preserve the history, culture, spiritual roots and educational opportunities in the local area. The applications and essays of the top ten percent of the 2018 Senior Class were ranked on their academic achievements, school and community activities, leadership, volunteer service and need. The committee is very proud of the top students who are recognized this year and exhibit the values esteemed by the Akin Hall Association’s founder. The Scholarship Committee members are Liz Allen, Akin Hall Association President; Betsy Brockway, Scholarship Chair; Valerie Busby; David Daniels; Ross Daniels; Stan Scherer; Terry Stewart and Nancy Tanner.